We love growing crystals and one of our favourite things to do is make our own sparkling decorations for the holidays and infuse them with wonderful scents. 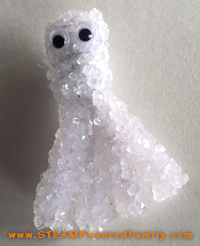 So this week we made scented Halloween crystal creations. 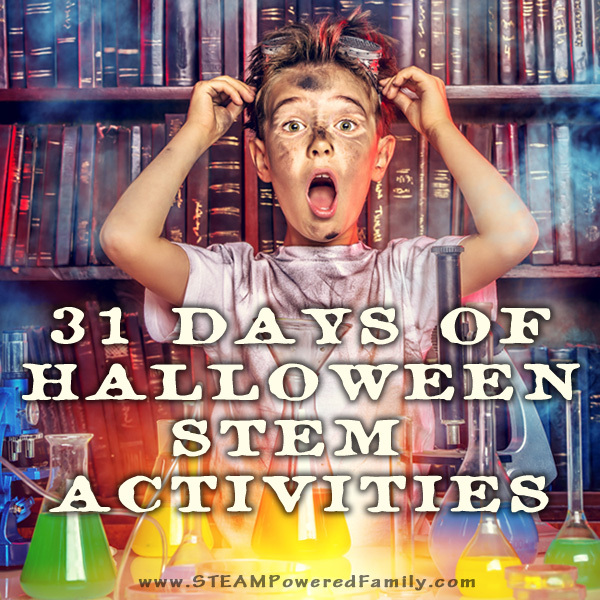 I’m always looking for ways to build on the boys fine motor skills and this is a super cool experiment that is so forgiving and easy the boys don’t even see it as work. For our designs we decided on a ghost, a spider and a pumpkin. We worked with the pipe cleaners to create the shapes we wanted and made larger ones and smaller ones so we would have a variety. Then we tied string around each creation and then tied them to our chop sticks. Now if you have fishing line or something thinner that would be nicer, but we only had string on hand. Once they were prepared I started heating water to make our solution. For every cup of water add 3 tablespoons of Borax. You want the water deep enough that you can suspend your creation without it touching the sides or bottom of the container. Add a few drops of food colouring if you wish. 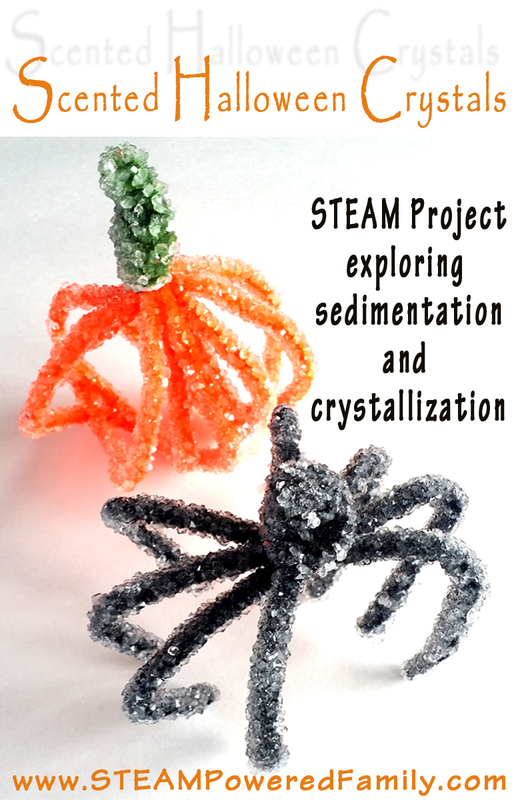 We don’t use food colouring, and instead let the clear crystals reflect the colour of the pipe cleaners. 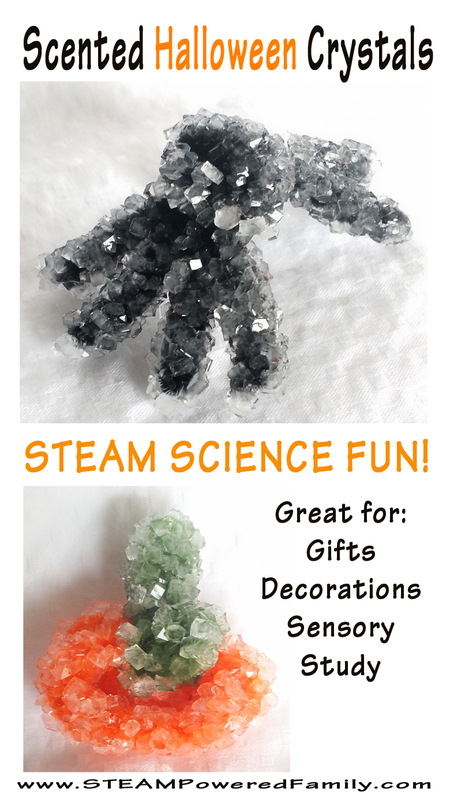 We also prefer this method because it’s easier for the kids to see the crystals forming in the solution and on the pipe cleaners. Stir the solution until the Borax is dissolved. Some might settle at the bottom, this is okay as long as most of it is dissolved. Set the bowl in a place where it will not be disturbed, knocked or prodded by curious fingers. Then carefully place the stick across the top so the creation is suspended completely in the solution. Leave it for 12 to 24 hours. After the time is up remove the crystals from the solution and set them to dry on a cloth or plate. Now is the time to add scent! Set the drying crystals beside a running essential oil diffuser. This was how I accidentally made our scented crystals the first time. 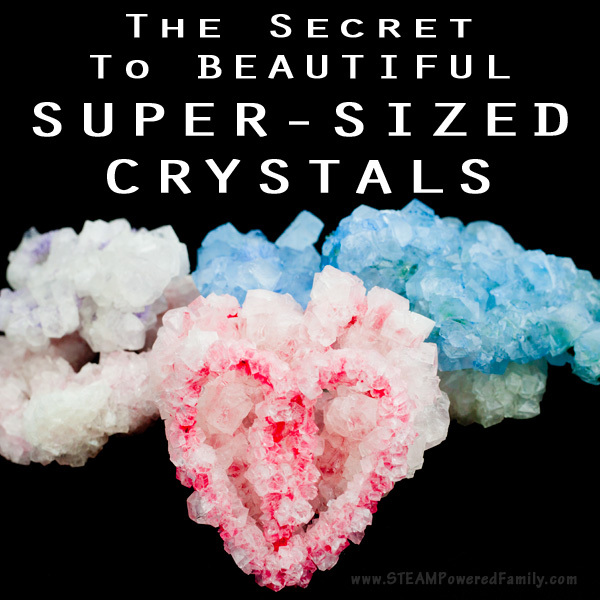 The crystals do an amazing job of absorbing the scents. You can also put a couple of drops of essential oil directly on to the crystals. For this batch I didn’t have any pumpkin scents so I used orange, a favourite in our house. The crystals smell amazing and the smell lasts a really long time. My last batch still smelled incredible after a month. The small creations are extremely hardy and put up with rough handling. So don’t be afraid to let the kids explore and play with their creations. We added googly-eyes to one for fun. The big spider with his spindly legs is a big more delicate. So if you want hardy, go with thicker, more compact designs. How can you use your new crystal creations? ~ And those smaller creations make great additions to sensory bins. So what exactly is going on here? Sedimentation and crystallization. Mixing the Borax into the hot water creates a suspension which is simply large solid particles suspended in fluid that settle out over time. The hot water helps to suspend the particles and keep them suspended longer. 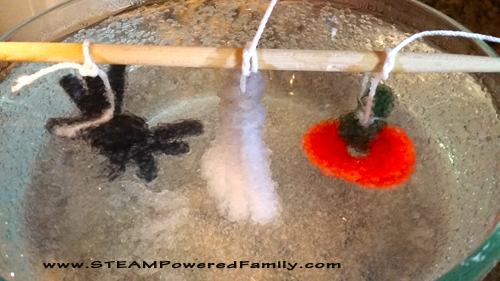 When sedimentation begins (the particles start to settle out) they crystallize on all the different surfaces including the container and your pipe cleaner creations. After a few hours of crystals forming on crystals you end up with your beautiful creations. Wow, I never would have thought of making crystals before! 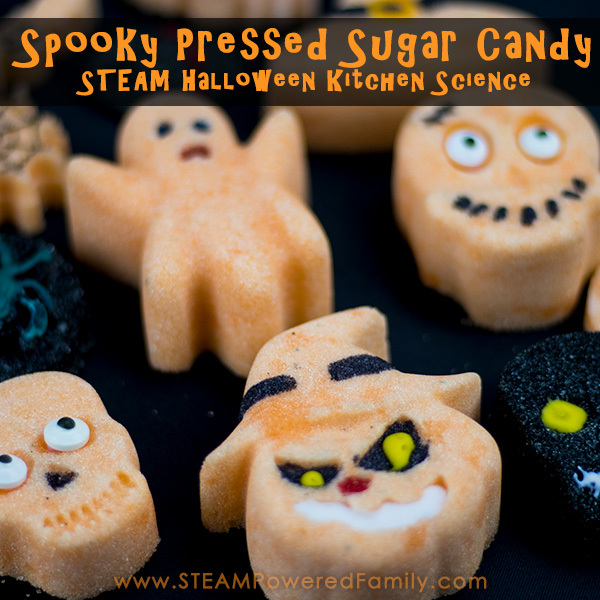 What a fun project to do with children! Thanks for partying with us at Talented Tuesday! This project is so cool. 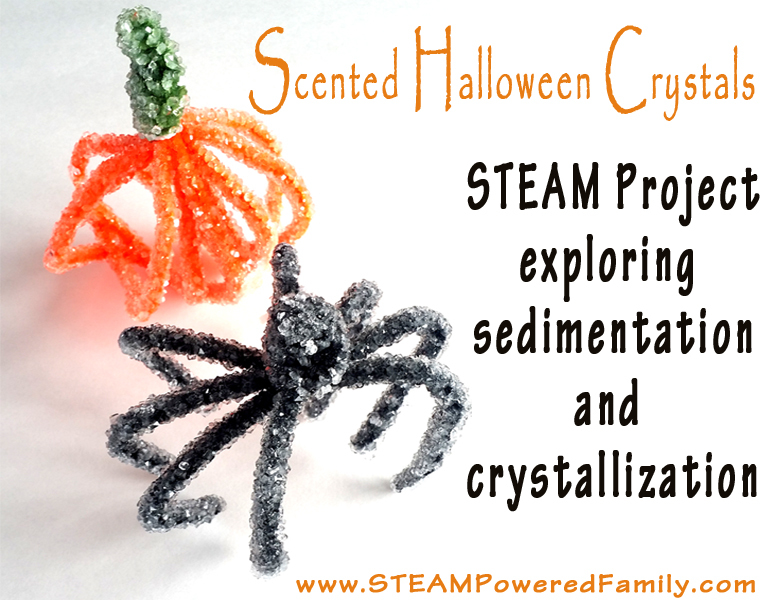 We’ve never experimented with crystals, and I know my kids would be fascinated. I can envision them making all kinds of other shapes too. Thanks so much for sharing this at #made4kids. I hope we see you again Sunday. They need to be completely submersed for sedimentation to occur. Thanks for reading! 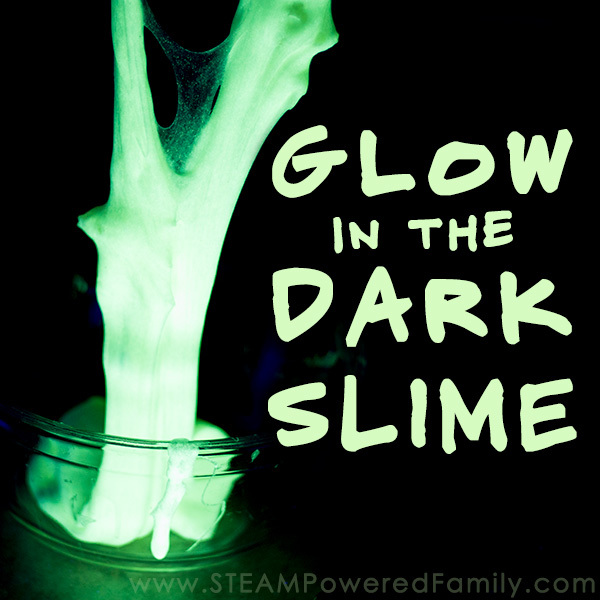 i want glow in the dark slime and glow in the dark oobleck ,gummy mummy’s , halloween crystals, spooky pressed sugar candy.